The standardised survey interview is a highly structured form of interaction. Interviewers ask questions from a script, and respondents select one of the pre­formulated answers. However, interviewers and respondents do more than just their pre-allocated tasks. 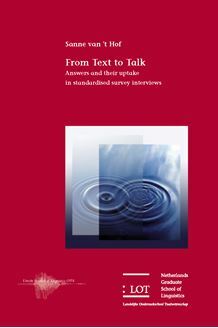 This study approaches survey interviews from an original perspective, entering the stage after the scripted question has been released into the interactional space. Interviewers and respondents switch roles, the interviewers becoming recipients of the respondents’ talk. That talk often makes clear the respondents’ stance towards the question or to the answer category that they select. Questionnaires cannot provide for all the contingencies that arise in the interaction following the scripted question. These contingencies are the topic of this thesis. Interviewers employ response tokens to perform the task of answer recipient. Respondents perform meaningful actions when they do not simply select one of the answer categories. Finally, interviewers need to deal with these responses, always balancing the rules of standardisation with the goal of obtaining recordable answers.